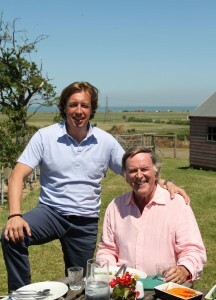 Television royalty, Sir Terry Wogan, and London Cabbie, Mason McQueen (A Cabbie Abroad), join forces to embark on the foodie’s ultimate adventure around the UK. Along the way, they check out the weird and wonderful British cuisine and look at how tastes have changed. The 20 part series has taken its inspiration from the 1963 book, British Bouquet: An Epicurean Tour of Britain, by Samuel Chamberlain. Wogan and McQueen set off in Chamberlain’s footstep in search of the great British foods of today and exploring their social history. Sampling the foods mentioned in the book, they compare ‘then and now’ and piece together their evolution from all the knowledge preserved by the local people they meet. Episode five focuses on Canterbury when the pair visit Canterbury Cathedral, The Goods Shed and Kent County Cricket ground. They also head to Whitstable, to sample local Oysters and Whelks and soak up the atmosphere of the working harbour and fishery before heading to The Sportsman, Seasalter’s local gastropub with a Michelin Star. 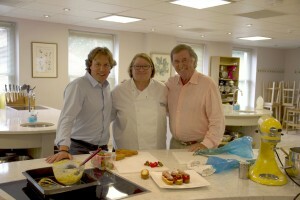 Episode nine sees the duo visit the historic town of Chiddingstone, where they sample the local Kentish ales at Larkins Brewery and The Pantiles, Tunbridge Wells and Rosemary Shrager’s Cookery School before heading to Penshurst Place. Canterbury is a vibrant City which boasts a Cathedral, busy shopping areas, parks and open spaces. Nearby is the seaside town of Whitstable which has a strong arts and culture scene and offers a harbour, shingle beach and busy high street. The area has previously featured on productions such as Who Do You Think You Are? (2013), Songs of Praise (2011) and A Canterbury Tale (1944). Chiddingstone is a one-street Tudor village and has previously been used as a film location by productions such as Walking Through History (2013), A Room With A View (1986) and Elizabeth R (1971). Tunbridge Wells is a large town situated in West Kent with a busy town centre and a period shopping area, The Pantiles, offering a fascinating variety of small specialist shops, antique shops, open-air cafés, restaurants and bars. Previous productions that have been filmed in Tunbridge Wells include The British Animal Honours (2013), Britain’s Best Bakery (2012), and How to Look Good Naked (2009). Penshurst Place is a Medieval and Tudor style manor house set in gorgeous parkland with formal Elizabethan gardens. Penshurst Place is a popular film location, having previously welcomed productions such as Wolf Hall (2015), The Great Fire (2014) and The Other Boleyn Girl (2008). Catch the Canterbury episode on Friday 4th September on BBC Two at 18:30 and the Tunbridge Wells episode on Thursday 10th September on BBC Two at 18:30. Walking Through History is a new Channel 4 series presented by Tony Robinson who embarks on spectacular walks through some of Britain’s most historic and picturesque landscapes. In the third episode, entitled “The Tudor Way”, actor and presenter Tony Robinson (Blackadder, Time Team) takes us on a 45 mile hike through the beautiful countryside of the Weald in Kent and across to East Sussex using some of Kent’s 4,400 miles of public footpaths. Along the way, Tony stops at Penshurst Place on a quest to find out more about the Tudors. There he seeks help from best selling author Philippa Gregory (The Other Boleyn Girl). He continues to walk along what used to be secret footpaths to Hever Castle to explore the connections between Henry VIII and the Boleyn sisters. Penshurst Place is in West Kent and a beautifully preserved Medieval and Tudor fortified style manor house with a unique Baron’s Hall and several staterooms. It is set in parkland and has Elizabethan formal gardens. Penshurst Place is a favourite with TV and film productions, having been previously seen on screen in The Hollow Crown – Henry V (2012) Merlin (2008) and The Other Boleyn Girl (2007). Hever Castle is a thirteenth century castle which was once the childhood home of Anne Boleyn and boasts formal Italian Gardens and an ornamental lake. Hever Castle has been used on film by various productions including Inkheart (2008) and Anne of a Thousand Days (1969). 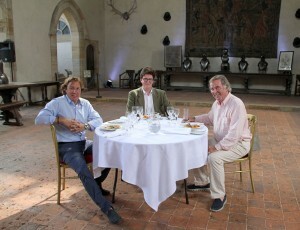 Don’t miss Walking through History “The Tudor Way” which will be shown on Saturday 13th of April 2013 at 20:30 on Channel 4. The Wind in The Willows – Mr Toad’s Wild Ride is a feature film loosely based on the classic novel by Kenneth Grahame, sometimes referred to as ‘the Monty Python version’. The story follows Mole whose home is bought up and marked for development by the evil Weasels. Working with his friends, Mole attempts to win back his home. Directed by Terry Jones (Monty Python and the Holy Grail, Life of Brian), the film has an ensemble cast including Steve Coogan (I’m Alan Partridge, Philomena), Eric Idle (Monty Python and the Holy Grail, Nuns on the Run), John Cleese (Monty Python and the Holy Grail, Fawlty Towers), Stephen Fry (Gosford Park, Sherlock Holmes: A Game of Shadows) Bernard Hill (Titanic, The Lord of the Rings) Michael Palin (Monty Python and the Holy Grail, A Fish Called Wanda) and Robert Bathurst (Cold Feet, Emma). The production filmed at Dover Castle, which doubled as the Gaol as well as The Old School in Chiddingstone (now the post office) which features as the Welcome Inn where Toad dines before stealing and crashing a motorcar. Dover Castle is a stunning medieval castle situated on the White Cliffs of Dover, overlooking the English Channel. Dover Castle is a popular film location having featured in Into the Woods (2015), Poirot “The Clocks” (2009) and Hamlet (1990). Chiddingstone is a beautiful one-street Tudor village with over 70% of the buildings in more than 200 years old. In 1939, the National Trust bought the village in order to preserve it. The village has previously been used as a film location by productions such as Terry and Mason’s Great Food Trip (2015), A Room With A View (1986) and Elizabeth R (1971). 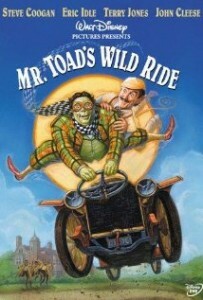 The Wind in the Willows – Mr. Toad’s Wild Ride is available to purchase on DVD. Kent Filming Locations Used: Emmett’s Garden in Sevenoaks, Chiddingstone, Brasted. Set in the early 1900’s, Lucy Honeychurch (Bonham Carter) embarks on her first trip to Florence chaperoned by her elderly spinster cousin Charlotte Bartlett (Maggie Smith). When Lucy meets eccentric George Emerson (Julian Sands), Charlotte fears that the two young people are becoming a little too familiar and beats a hasty return to England. Once home, Lucy begins a courtship with the stoic Cecil Vyse (Daniel Day Lewis), a far cry from the free spirited George. However Lucy soon finds herself torn between duty to her fiancé and her love for George, who miraculously appears in her life once more. A beautiful and romantic social comedy, this Merchant Ivory film showed audiences the beauty of the Kent Countryside, as they filmed at a private residence in Brasted to double as the Honeychurch’s family home. Owned by the National Trust, Emmett’s Garden in Sevenoaks became the venue for Lucy and Cecil’s engagement party in the film. A beautiful location, Emmett’s Garden was created in the late 19th Century and contains many exotic and rare trees and shrubs from around the world. Also in Sevenoaks, the village of Chiddingstone featured in the film as the setting for Lucy and Cecil’s post engagement-party walk. Owned entirely by the National Trust, it is the perfect example of a Tudor one-street village where approximately over 70% of the buildings are at least 200 years old. In the scene you can also see St Mary’s Church in Chiddingstone which was built in the 13th Century. Sevenoaks is also home to the historic Hever Castle, childhood home to Anne Boleyn. The castle has featured in a number of productions, namely Inkheart (2008), Lady Jane (1986) and Anne of a Thousand Days (1969). 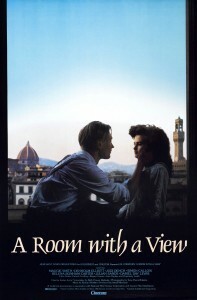 A Room With A View was released in cinemas in April 1986 and is now available to buy on DVD.